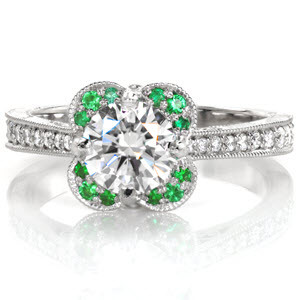 This new custom created engagement ring is brightening up everyone’s outlook here at Knox Jewelers. This recent custom creation features an extraordinary 2.00 carat round yellow sapphire. An unusual scalloped diamond halo and dramatic double claw prongs frame the center gemstone. This chromatic yellow sapphire reminds us how extraordinary colorful engagement ring can be! The profile view of this custom design is not forgotten. 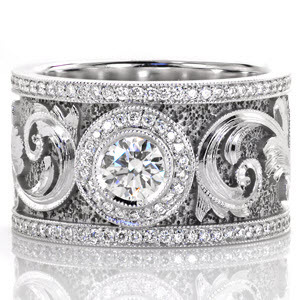 Bead-set diamonds, milgrain edging and elaborate scroll relief engraving don either side of the ring. A top view band of matching bead-set diamonds finishes this design to perfection. Knox’s ability to flawlessly incorporate colored stones into any custom piece is demonstrated in this and several other recent commissions. A perfect pairing of vintage detailing, glittering diamonds and a stand-out center stone makes Design 3520 a custom ring that is sure to attraction attention. 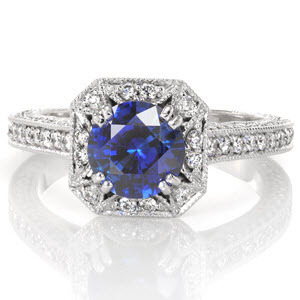 Knox hand finishes and outstanding craftsmanship will ensure that this platinum and fancy colored sapphire engagement ring will last a lifetime. This distinctive golden hued diamond halo ring engagement ring design can be recreated to accommodate any type, shape, or size center stones. Contact Knox Jewelers today to custom tailor this design to your preferred precious metal and central gemstone selection to create your own one-of-a-kind engagement ring! 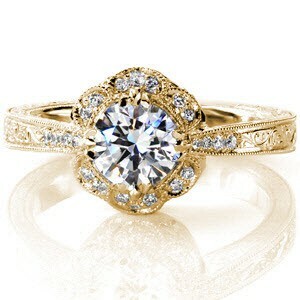 Our new favorite custom created engagement ring is all the buzz around the shop, here at Knox Jewelers. This resent custom creation is inspired from one of our most noteworthy antique inspired stock designs, the Rachel Lily. 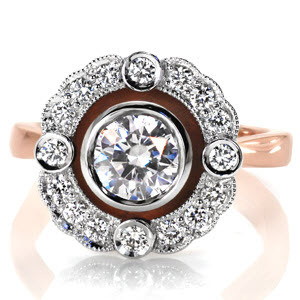 This version of the setting has been modified to include a glittering bead set diamond halo framing the center bezel set 1.00 carat oval cut diamond. An elegant knife edge band tapers from either side of the central halo. The profile view of the setting is embellished with bead set diamonds, filigree pockets and dramatic relief scroll engraving. Design 3338 is a visual tapestry of details, with Knox hand finishes to dazzle the eye at every angle. 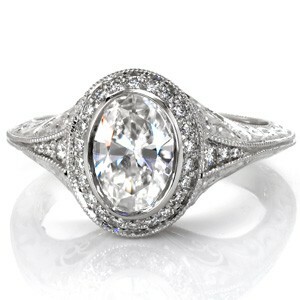 This astonishing antique inspired halo design can be recreated to accommodate any type, shape, or size center stones. Contact Knox Jewelers today to custom tailor this design to your preferred precious metal and central gemstone selection to create your own one-of-a-kind engagement ring! Here at Knox Jewelers, our new favorite custom created engagement ring centers around a distinctive 1.00 carat pear cut diamond. 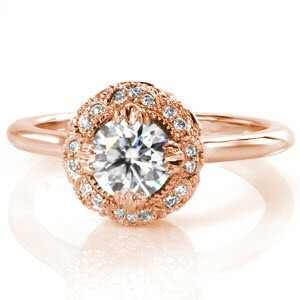 The tapering outline of the band draws focus onto the beautifully shaped center stone. Channel set diamonds, scroll hand engraving, and milgrain edging complete the top view of the ring. The profile of the design displays floral elements including a bezel set marquise shaped diamond. Design 3374 is a wonderful juxtaposition of flowing lines, floral shapes and Knox’s heirloom quality finishes! This hand detailed floral design can be recreated to accommodate any type, shape, or size center stones. Contact Knox Jewelers today to custom tailor this design to your preferred precious metal and central gemstone selection to create your own one-of-a-kind engagement ring! At Knox Jewelers, featuring halo engagement rings have been on trend for several years now, but these setting designs are anything but new. In decades past it was not uncommon for engagement rings to feature small diamonds or gemstones completely encircling, and enhancing the center stone. Halo ring were very common in the Edwardian, Victoria and even the Art Deco era. Framing your center stone in a diamond halo is a dazzling way to highlight and visually amplify the gemstone. A halo can be custom created around any size or shape diamond or sapphire. There are no rules when selecting a halo setting. It doesn’t have to be straight; the halo can be petal-shaped, square, or undulating. 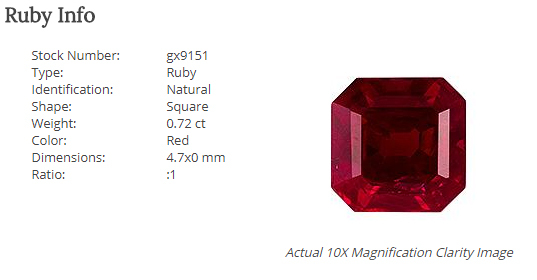 Most any shape halo is possible with Knox custom creation. If a colorless diamond halo is not what you had in mind, add some color with fancy hued sapphires or diamonds. If you are a devotee to both vintage inspired and halo ring settings, you are going to love how Knox has juxtaposed the two into amazing one-of-a-kind creations. Listed below are several antique engagement ring illustrating the vast number of ways a halo can be incorporated into a custom setting. If you have any questions about antique halo engagement ring or any of the custom ring settings featured above, please be sure to let us know. We’re always happy to answer any questions you may have, and we look forward to working together with you to design a work of art that will last and be passed down throughout the ages. Get in touch with our friendly and professional staff today. We will aid you on the journey to creating your very own, one-of-a-kind piece of custom engagement ring, with or without a halo!